First published in the United Kingdom in 1985. Second corrected impression in 1990. Second edition 2005. Reprinted in 2015. 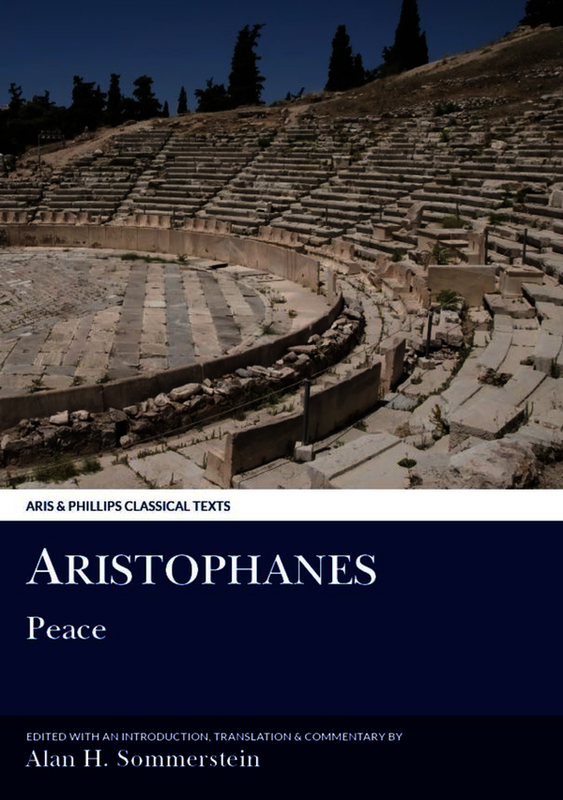 Produced in 421 B.C., Peace is, in one respect, unique among Aristophanes’ plays. The typical Aristophanic plot takes its start from something that is wrong with the current state of Athenian life and which, while it may be capable in principle of being corrected, stands next to no chance of ever being put right in practice except by the methods of comic fantasy. Peace likewise takes its start from something that is wrong with the current situation – namely, as in Acharnians and Lysistrata, the continuing war against the Peloponnesians; but on this occasion the wrong was one that was actually on the point of being set right in the hard world of reality. Aristophanes celebrates in anticipation of the conclusion of the great war with Sparta. Peace, we are made to see, is within the grasp of the Greek peoples; let them make one final effort, and all difficulties and dangers will evaporate in the joys of feasting and rustic leisure. This volume presents the Greek text with facing-page translation, commentary and notes. The second edition has been substantially updated with extensive addenda to the Notes and Bibliography. Alan H. Sommerstein is Professor of Greek and Director for Ancient Drama and its Reception, University of Nottingham, and editor of a celebrated complete edition of Aristophanes volumes in the Aris & Phillips Classical Texts series. His many other publications include Aeschylean Tragedy (1996), an edition of Aeschylus Eumenides (1989), Greek Drama and Dramatists (2002) and Sophocles: Selected Fragmentary Plays Volumes 1 and 2 (2006, 2011) in this series. Alan H. Sommerstein is Professor of Greek and Director for Ancient Drama and its Reception, University of Nottingham, and editor of a celebrated complete edition of Aristophanes volumes in the Aris & Phillips Classical Texts series. His many other publications include 'Aeschylean Tragedy' (1996), an edition of 'Aeschylus Eumenides' (1989), 'Greek Drama and Dramatists' (2002) and 'Sophocles: Selected Fragmentary Plays' Volumes 1 and 2 (2006, 2011) in the Aris & Phillips Classical Texts series.